28 years or 30 years ??? Please anyone will clarify it ?? How much is the salary package? As per my research it is way less than OG-3 of SBP. Plz reply age requirement is 28 or 30? What are perks and privileges of OG-III, if posted other than home district? how much is the salary for this post, if anyone knows? 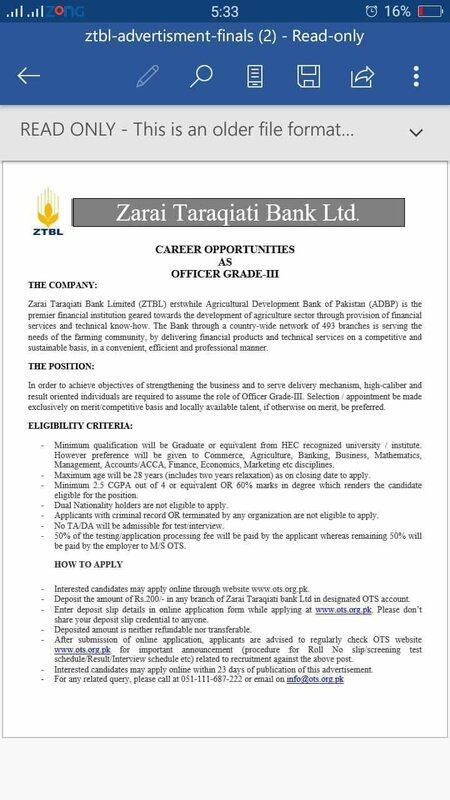 Recruitment offers are there from ZTBL Jobs 2018 Apply Online Zarai Taraqiati Bank Limited. ZTBL (Zarai Taraqiati Bank Ltd.) is one of the well-known banks. Currently, this reputed Bank is looking to recruit highly educated, very experienced, hardworking and well-disciplined candidates for the following positions such as (Officer Grade-III OG-III) (350 Posts)are the vacancies need to be filled. The appointment of these post will be on regular basis under Bank's Staff Regulations (SR-2005). Candidates wanted to apply for this post, should hold Minimum Graduation or equivalent degree from HEC recognized university/institute is required to apply and preference shall be given to those having degree in Commerce, Agriculture, Banking, Business, Mathematics, Management, Accounts/ACCA, Finance, Economics, Marketing etc. Age of application should be 28 years and it includes 2 years relaxation as on closing date to apply. For interested candidates, we have provided complete how to apply procedure in the following heading.